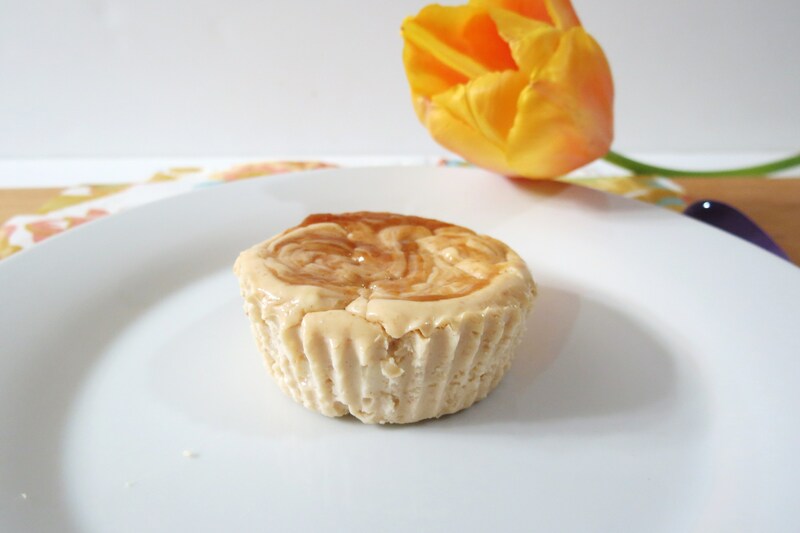 Creamy, decadent, guilt free peanut butter cheesecake. Pure heaven in every bite! Line a standard muffin tin with 8 muffin foil liners and lightly spray with cooking spray. In a small bowl add cream cheese and stevia and beat until creamy. Add vanilla extract, egg and salt, beat until combined. Beat in yogurt and 2 heaping tablespoons of peanut butter. 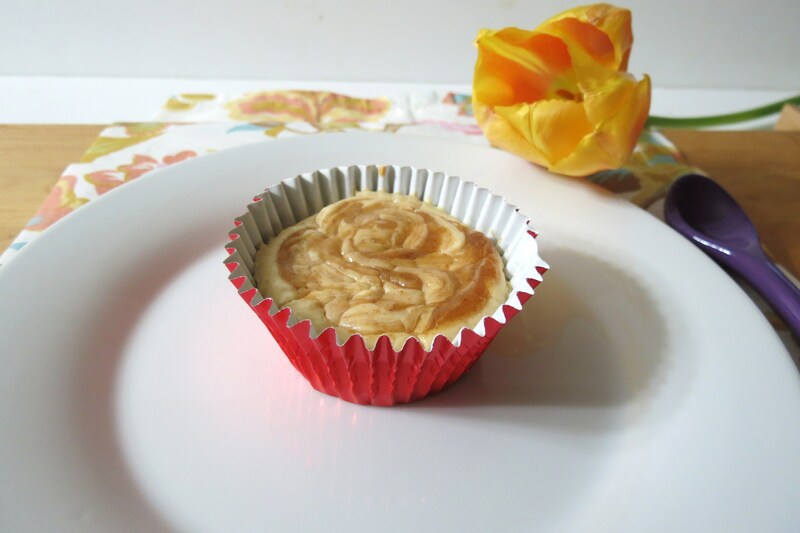 Place a vanilla wafer on the bottom of each muffin liner and top with cheesecake batter. In a small bowl add 1 tablespoon of peanut butter and 1 tablespoon of milk. Mix until combined. 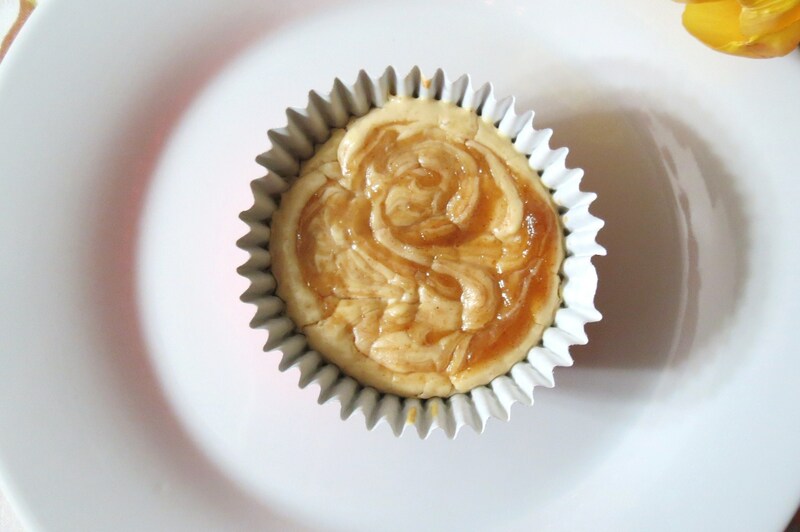 Drop peanut butter mixture evenly on top of each cheesecake, with a knife swirl over the top. Bake, rotating pans halfway through, until filling is set, 22-24 minutes. Let cool on a wire rack. Chill in the refrigerator for at least 4 hours, or up to overnight, before serving. Craving another recipe? I’m guest blogging over at Fit Mama Real Food today while she enjoys spending time with her new baby! Congratulations Heather on your new baby boy Hunter! He is just simply adorable!!! peanut butter cheesecake??? your recipes keep getting better and better!! I’m pretty sure you’re my hero. I’m amazed at how deliciously guilt free these are! I LOVE YOUR RECIPES!!! Just curious, but in all of your peanut butter recipes, what brand of PB do you use? Thanks Whitney! Actually I usually use my homemade peanut butter majority of the time, but for jarred PB, I usually use Trader Joe’s all natural or there almond butter with sea salt. For regular grocery stores, I like Justin’s Nut Butter and Peanut Butter and Co, (these two are cheaper at Target) or Skippy All Natural! But 80% of my recipes I use homemade PB! GUILT FREE?? You rock. These look perfect! This was so good! My mouth just watered looking at the pictures! Another great job!!! Thanks Andrea!! This is one I’ll have to make again and soon!! I’ll bring some into work when I do! Btw your peanut butter cheesecake looks amazing!!! lol, yah! I can’t look at the pictures because I just want another and there long gone!! Why did I share them with my friends and family? Happy Friday to you!! I hope you have a relaxing weekend! You need it with work and planning a wedding!! Your peanut butter swirl is gorgeous!!! And who can resist guilt-free cheesecake???? Not me! Thanks Liz! 🙂 Have a great weekend!! great recipe and idea! I love making mini/self-serve anything. I love the single-serve portions and using the liners. The last pics make it almost look frozen! I bet these would freeze great as a really great little treat! Oh no Averie, I never thought to freeze them! I am so going to try that next time! What a great idea!!! My Husband asked me to make your single serve cake again, than I showed him your newest creation of your double chocolate chip cookie cups with ice cream and his eyes lit up! I’m going to surprise him with that soon!! Have a wonderful weekend! Was the cream cheese reduced fat, or fully fat free? OMG these look amazing! 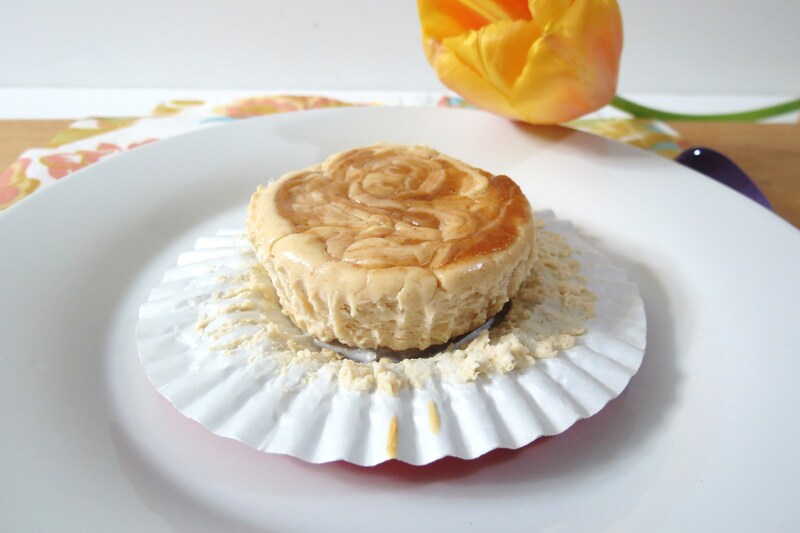 I’ve never tried cheesecake with PB and now I’m very curious as these look GREAT !! 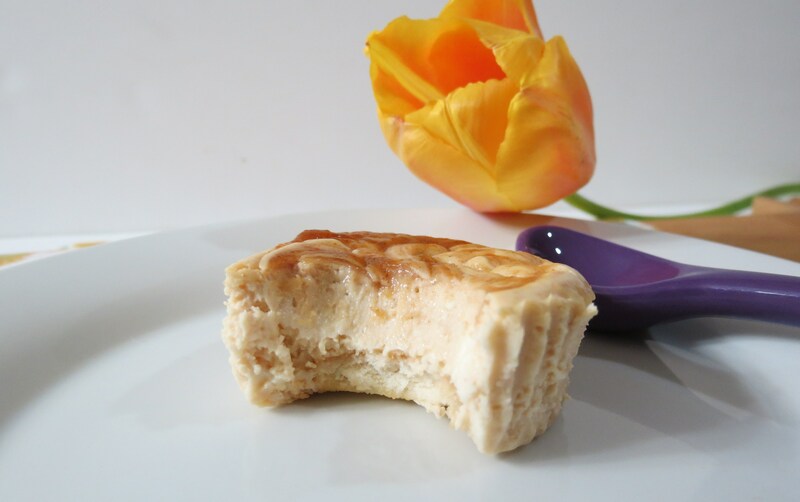 Oh my if you like Peanut Butter, you will LOVE this cheesecake. 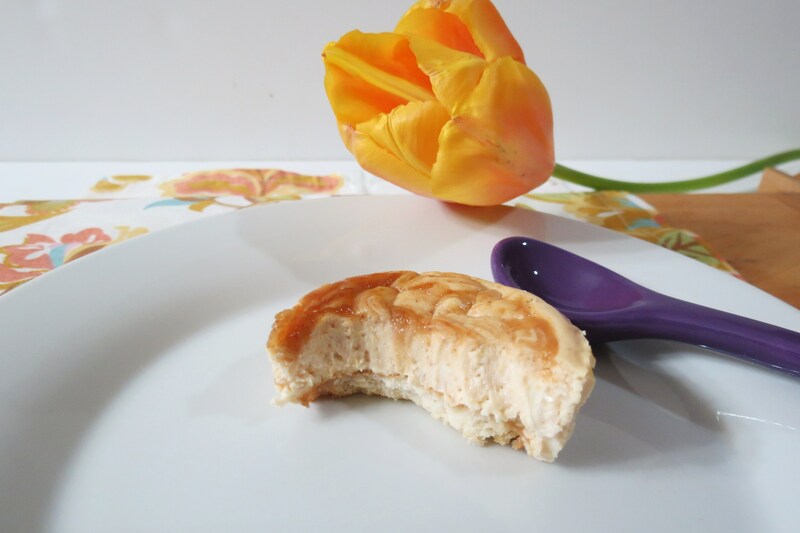 Actually this is the first time I ever had PB Cheesecake and it is out of this world! 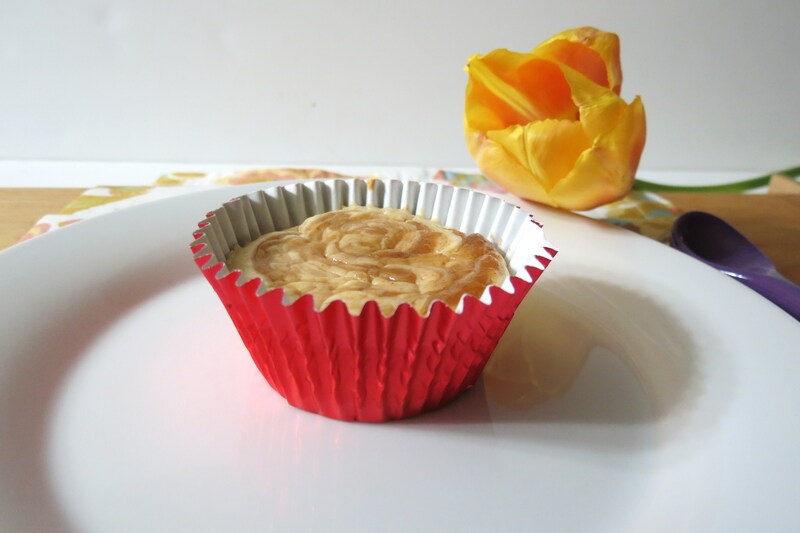 Guilt free cheesecake? Yes please!!! These sound so yummy. Oh my wow! I need to try this! Thank you for having me. Can’t wait till next Monday!! holy canoli! this looks wonderful! thank you for linking up on successful saturdays! Thank you for having me!!! I can’t wait to link up this Saturday!! 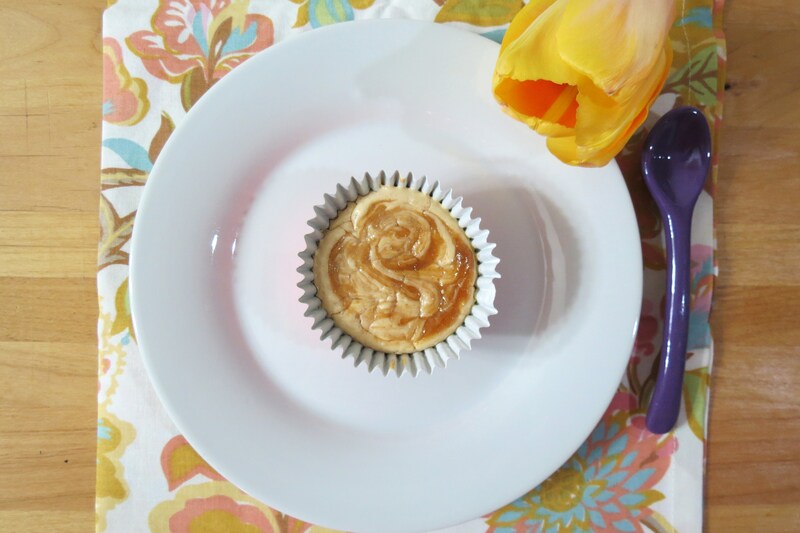 Thanks for linking up to Sweet & Simple Sunday last week, you are being featured this week! Stop by and check it out!! Thanks for sharing! Thank you for having me!!! I love Sweet & Simple Sunday!!! Have a great week!